Tariffs will go into effect Aug. 23. In response to the U.S. Trade Representative’s (USTR’s) office publishing its final list of $16 billion in Chinese goods that will be subject to an additional tariff of 25 percent as of Aug. 23, China has announced its intentions to begin imposing an additional tariff of 25 percent on certain goods, including scrap, imported from the U.S. starting on that same date. The Institute of Scrap Recycling Industries (ISRI), Washington, says the U.S. exported a total of $5.6 billion worth of scrap commodities to China in 2017. Through the first six months of 2018, the total of U.S. scrap exports to China was $2.2 billion, a decrease of 24 percent from the same time frame last year, the association adds. “ISRI is already hearing from contacts in China that the announcement has caused consternation among Chinese consumers of U.S. scrap commodities,” the association says in a statement regarding China’s most recent round of tariffs. “Although these tariffs will not be levied on imports from other countries, it is our understanding that other regions may not be able to fulfill all of China's demand. This is in line with other reports that the trade war has had an impact on the Chinese economy across many sectors. The list of Chinese goods to be taxed as of Aug. 23 from the USTR’s office contains 279 of the original 284 tariff lines that were on a proposed list announced June 15. Changes to the proposed list were made after USTR and the interagency Section 301 Committee sought and received written comments and testimony during a two-day public hearing last month. In March 2018, USTR released the findings of its Section 301 investigation that found China’s acts, policies and practices related to technology transfer, intellectual property and innovation are unreasonable and discriminatory and burden U.S. commerce. According to the investigation, China uses joint venture requirements, foreign investment restrictions and administrative review and licensing processes to require or pressure technology transfer from U.S. companies. The country also deprives U.S. companies of the ability to set market-based terms in licensing and other technology-related negotiations and directs and unfairly facilitates the systematic investment in, and acquisition of, U.S. companies and assets to generate large-scale technology transfer, the USTR says. Additionally, China conducts and supports cyber intrusions into U.S. commercial computer networks to gain unauthorized access to commercially valuable business information. A 13-story building in Miami Beach collapsed during a controlled demolition, causing debris to hit a worker and sever his leg. A construction worker died the morning of Aug. 3, more than a week after a demolition accident in Miami Beach severed his leg, a report by WPLG Local 10 says. The 13-story Marlborough House condominium building collapsed July 21 “in an unsafe manner, causing debris and thick smoke” to cover a nearby street, the report says. Because of the debris that fell in the surrounding area, police shut down nearby streets for blocks. Authorities say in the report that there was a demolition permit for the building, but not an implosion permit. According to the report, something happened during the controlled demolition that caused the entire structure to collapse. Witnesses saw a piece of debris strike the worker just below the chest, throwing him several feet, the report says. A video shows the worker at the site when a piece of flying debris hits his leg. He was taken to Jackson Memorial Hospital’s Ryder Trauma Center by Miami Beach Fire Rescue, where he was initially listed as being in critical condition. The report says the Marlborough House was set to be demolished to make way for an oceanfront tower. The new hire brings 40 years of construction and industrial equipment sales experience to the job. Brokk, Monroe, Washington, announced Aug. 8 that the company has hired Phil Gangluff as regional sales manager for the U.S. Great Lakes region. Gangluff manages sales for both Brokk robotic demolition machines and the company’s Aquajet Systems hydrodemolition robots. He provides support to current customers and is working to bring safety and efficiency best practices regarding the company’s machines to more job sites throughout Indiana, Kentucky, Michigan, Ohio, West Virginia and Western Pennsylvania. “Phil’s extensive experience helping customers find equipment that makes them successful is a valuable contribution to our team and helps him provide great insight to our customers,” Peter Bigwood, vice president of sales and marketing at Brokk, says. Gangluff joins Brokk with 40 years of construction and industrial equipment sales experience. Prior to this appointment, he was a regional sales manager at Kärcher North America, Denver, for 16 years. Before that, he worked at Streacker Tractor Sales, Findlay, OH, as an equipment sales specialist. OSHA issued a final rule to extend the compliance date for specific ancillary requirements of the general industry beryllium standard. The U.S. Department of Labor’s Occupational Safety and Health Administration (OSHA) issued a final rule Aug. 8 to extend the compliance date for specific ancillary requirements of the general industry beryllium standard to Dec. 12, 2018. OSHA has determined that the extension will maintain essential safety and health protections for workers while the agency prepares a Notice of Proposed Rulemaking to clarify certain provisions of the beryllium standard that would maintain the standard’s worker safety and health protections and address employers’ compliance burdens. OSHA began enforcing the new permissible exposure limits for general industry, construction, and shipyards, and the general industry provisions for exposure assessment, respiratory protection, medical surveillance, and medical removal on May 11. Those requirements are unaffected by this rule. Any provisions for which the standard already establishes compliance dates in 2019 (change rooms and showers) or 2020 (engineering controls) are also unaffected by this rule. Chicago’s Lakeshore Recycling Systems implemented dust suppression technology to keep workers safe and comfortable during its expansion. Chicago, like many areas of the country, is currently going through a building boom. Nearly all categories of construction, from single-family residential to commercial and mixed use, have seen growth in the past couple of years. One result of the uptick is a higher demand for local construction and demolition (C&D) recyclers. In 2012, two midsized Chicago-based recycling companies merged to become Lakeshore Recycling Systems (LRS), Morton Grove, Illinois. The company has since acquired two more locations, allowing the firm to raise its production to 1.5 million tons of debris processed annually. The company says it is now the largest provider of construction debris disposal containers in the Chicago area. Along with that increased volume comes a greater amount of dust created at its recycling centers, which has the potential to affect air quality and worker safety. With environmental stewardship a key component of the company’s operating philosophy, company officials wanted to take a proactive approach to dust suppression at its facilities. Lakeshore Recycling Systems started using a sprinkler system for its dust management needs, but realized that it wasn’t adequate. Sales of raw separated material contribute to a large portion of the company’s revenue, along with dumping fees and container rentals and transport. In most cases, the company drops off one or more containers at a demolition site, where it’s up to the contractors to control any fugitive material and dust. When LRS picks up the full container, it is covered with a tarp to contain dust during transport and hauled to one of the company’s three locations. In all, hundreds of vehicles, including the 55 company-owned waste collection trucks, arrive daily to deliver recyclable materials from more than 6,000 commercial and municipal customers. Each incoming vehicle is weighed upon entry and exit to determine its disposal fee. The recycling process begins when a front loader pushes the bulk material into a 25,000-square-foot, three-walled, open-air structure. The debris is loaded onto a tipping floor leading to a large steel screen with 2-inch openings. Industrial vibrators shake the screen, which is set at a 7-degree slope, to move the material slowly down the incline. Small debris (dirt and aggregate) falls through the holes and onto a lower conveyor belt to be transported to the landfill. The remaining larger debris is conveyed to a sorting area. Once separated, the screened debris drops onto a 5-foot-wide conveyor belt and is then transferred onto another curved conveyor feeding the large material picking line to be further sorted. Wood, glass, steel, cardboard, brick and concrete are removed. Sorted material is then sold to various vendors for repurposing. Sredin says larger materials also are manually sorted and placed in pieces in bins. 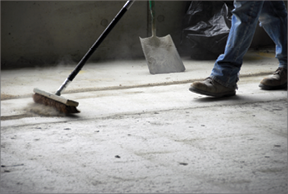 This requires a safe work area, with dry floors and adequate air quality. However, with all the mechanical agitation, the process creates large volumes of fugitive dust and a need for dust suppression. 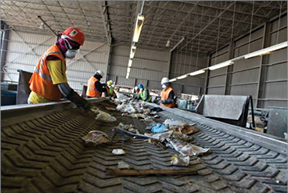 Once separated, the screened debris is transferred onto a conveyor feeding the large material picking line to be sorted. 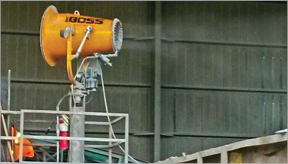 LRS started using a large sprinkler system for its dust management needs, which is common in many bulk handling applications, but Sredin and his team quickly realized that it wasn’t adequate. Company officials performed a detailed search looking online and through trade magazines for a better solution, eventually contacting BossTek, headquartered in Peoria, Illinois, to learn more about the company’s family of atomized mist dust suppression systems. Convinced they needed to make a change, the firm purchased its first DustBoss DB-30 for one of its locations with the intention of replacing the ineffective sprinkler system. Initial testing was successful, and operators reported a substantial improvement in air quality along the debris sorting line, as well as dramatically reduced pooling and runoff. Based on that experience, LRS has now installed a unit in each of its facilities, creating safer and more efficient workplaces for the company’s more than 350 employees. 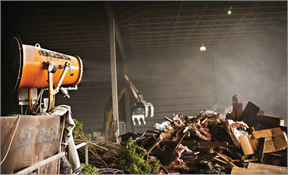 Since installing the DustBoss DB-30, operators report a substantial improvement in air quality, with dramatically reduced runoff. Sredin says that his team chose the DB-30 because of its rugged construction and long warranty. The DB-30 uses a 7.5-horsepower fan delivering 9,200 cubic feet per minute to project a 100-foot cone of dust-trapping mist. With an adjustable throw angle of 0 to 50 degrees in height, the unit has a coverage area of 31,000 square feet when equipped with an optional 359-degree oscillation feature. The company’s three-sided building configuration poses a unique challenge for LRS. Even though it is an enclosed space, operators still have to contend with the elements such as wind, rain and severely low temperatures. According to Sredin, merely adjusting the unit’s spray angle allows the unit to negate the swirling wind within the complex. “Our DustBoss is on all day, every day. When it rains or snows, there’s less dust, so we simply turn off the atomizer and allow the strong fan to clear the air. It’s very versatile,” he says. Lakeshore Recycling Systems has installed a DustBoss unit in each of its facilities, creating a safer and more efficient workplace for its 350-plus employees. Sprinklers are used by many industries for dust suppression, but they have been proven to be ineffective unless material is totally saturated prior to any disturbance. The primary reason is that a water droplet from a sprinkler is typically between 2,000 and 6,000 microns in size. In contrast, dust particles are generally 50 to 100 microns in size. Because of the larger mass of the droplet, two issues can arise that prevent effective dust suppression. First, the impact of the droplet on settled dust can actually cause the dust to become airborne. After being set aloft, fugitive dust particles are carried by air currents, becoming subject to the second issue: the “slipstream effect.” This happens when the size and velocity of the sprinkler droplet affects the airflow around it. The large droplet approaches airborne particles, but the airflow deflects the particles without a collision, preventing effective dust management. To overcome this tendency, the atomized mist emitted from the DB-30 is made up of millions of droplets between 50 and 200 microns in size. The unit injects 100 pounds per square inch of water through a brass ring equipped with atomizing nozzles, creating minuscule droplets that are propelled by the fan and travel with the dust, colliding with particles to capture them and pull them to the ground. The main source of incoming material at Lakeshore Recycling is from C&D projects, including concrete, wood and drywall. When LRS acquired its Southside Chicago location from a smaller competitor, it found that similar inefficiencies were leading to lackluster dust suppression on-site. In 2014, the company purchased Heartland Recycling in Forest View, Illinois, which had installed three small atomizers that didn’t contain adequate fans. The city’s incentive plan has increased the volume of recycled C&D debris above that of residential materials. C&D debris now accounts for 85 percent of all recycled material, with approximately 500,000 tons recycled each year. A company spokesman says LRS will meet increased production expectations for C&D material as the construction market continues to be strong. Sredin says with each new facility, there is anticipation that dust suppression equipment will continue to play a pivotal role in helping LRS keep workers comfortable and safe, while allowing the company to take on larger volumes. Mike Lewis is a sales manager for BossTek. He can be reached at mikel@bosstek.com.